Protecting your child is a natural instinct that you cannot ignore. And part of your love and duty for your child lies in getting them regularly vaccinated. Some vaccines are delivered as early as on birth, such as BCG that prevents TB and bladder cancer, Hepatitis B, polio, etc. Many vaccinations are repeated after specified periods of time, as per the vaccination schedule recommended by the Indian Academy of Pediatrics (IAP). But there are some vaccines that you may not know about that have gained importance over time and that you might want to consider for your kids. Rotavirus is an infection that causes diarrhea and is common in infants and children worldwide. The treatment of rotavirus involves giving ample fluids to the child. Dehydration due to rotavirus infection is the leading cause of childhood deaths in developing countries. IAP recommends two doses of RV1 at 10 and 14 weeks or three doses of RV5. Meningococcal disease is a bacterial infection of the protective membrane that surrounds the brain and spinal cord. This disease is very serious as its onset is rapid and there is a significant risk of death. The disease may also cause mental retardation, epilepsy, deafness and other life-changing consequences. IAP recommends this vaccine for high-risk category children such as those with immunodeficiency; cardiac, pulmonary and renal disease, children on long-term steroids, those who travel or have pets at home, etc. It is essential to consult a pediatrician to get to know which vaccines are best suited for your child. Hepatitis A is an acute liver disease that causes inflammation of the liver. It is transferred through contaminated food or water or by close contact with an infected person. The disease is usually mild in children but a child can transmit the infection to an adult who may experience more severe symptoms. The IAP recommends a single dose of live attenuated hepatitis A vaccine, based on the viral H2 strain at 12 months of age. OPD health insurance plans such as Day2Day Care provide insurance for vaccinations, enabling you to care for your child better. Tdap is a combination booster shot that offers immunization against three diseases caused by bacteria; diphtheria, tetanus, and whooping cough. Diphtheria is a respiratory disease that can cause breathing difficulties and paralysis, among other things. Tetanus, also known as lockjaw, is caused by a bacterium found in the soil that attacks the nervous system, causing muscle spasms and death, if left untreated. Whooping cough causes severe coughing spasms in infants. 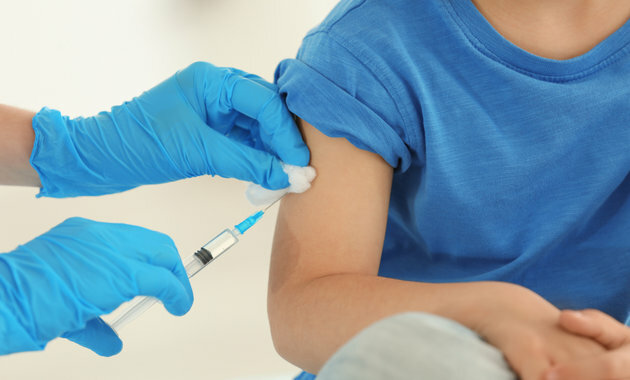 The IAP recommends a Tdap Booster vaccine to be first administered at the age of 10-12 years, followed by a Td vaccine every ten years that offers protection from tetanus and diphtheria. Make sure you consult your child’s doctor to make sure which vaccines are best for your child. A health insurance plan covering outpatient expenses such as doctor visits, medicines and vaccinations can help you give the best quality healthcare to your child. Here’s wishing your child a joyful, healthy childhood! Is Milk The Reason For Early Puberty? ← Common Cold: What’s Safe For Your Child?